PAMS Foundation co-founder Wayne Lotter was assassinated in Dar es Salaam in August 2017. Lotter’s murder rocked the conservation community and left a gaping hole in the hearts of the PAMS Family. Lotter, as he was known in Tanzania, had a passion for wildlife and wild places. He was a conservation warrior, a strategist, a trailblazer with resolute determination and courage. Lotter’s approach to life, work, and the things he cared about so deeply was much like the tactics one needs when exploring the deep African wilderness. At times there may be no track to follow and you rely heavily on your understanding of nature and your instinct to find your way. At times you must walk in the dark eerie night alone, guided only by the stars and if you are lucky, some moonlight. Other times you may have to take shelter from a storm or take time out to think and re-strategize. At times you have to search for much-needed water and determine what in this jungle will sustain you and what will destroy you. You have to be courageous and cautious in equal measures, but continue to push forward on your trail, not only to reach your ultimate goal, but also to leave behind a viable trail for those that follow. Lotter was a trailblazer. He found paths through what was before only dense impenetrable bush. He pushed aside fallen branches, endured the searing heat of the sun as it baked down on Africa, and forded many raging rivers. Not a day goes by where he doesn’t pop into our minds at some point—remembering his funny quirks that brightened up our day with laughter or recalling him speaking with utmost passion. As PAMS continues its work training and supporting rangers to undertake patrols in conservation areas, teaching environmental education to those living nearby national parks, working with communities to help mitigate human-wildlife conflict, and empowering those who protect wildlife and wild places, it is done with integrity, zest and with the same passion as Lotter. In every action we take, we uphold the values he stood for, fought for, on which PAMS Foundation was built. His death is a constant reminder of the dangers we face in the conservation community. In the last year, more than 200 environmental defenders have been killed protecting our planet’s wildlife. It’s a dangerous world, but one Lotter believed was worth saving. As we commemorate him, he and his values remain a symbol and inspiration for us and many others. 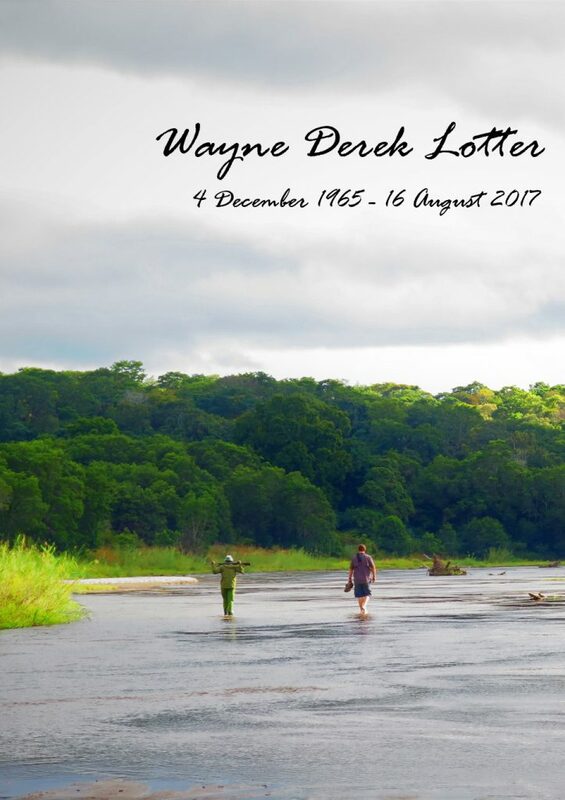 Wayne Lotter was a legend in life and now in death. We give thanks for the heartfelt tributes to Wayne from around the world.